Michigan employees, who have been injured at work or who suffer from an occupational illness, may be entitled to lost wage compensation and medical benefits. Workers compensation was implemented in most states in the early 1900s. Michigan adopted a workers' compensation act in 1912. The intent of Michigan's workers compensation act was to provide death benefits, vocational rehabilitation, wage loss compensation and medical benefits to injured employees. Workers compensation has eliminated the need for injured employees to sue their Michigan employers for compensation or to prove their employer's negligent actions caused their work injury. Workers' compensation, instead, allows the employees, if they qualify, to receive immediate benefits from their employer's workers' compensation insurance. Workers' compensation in Michigan is administered by Michigan's Workers' Compensation Agency whose goal is to "efficiently administer the Workers' Disability Compensation Act of Michigan, which includes carrier and employer compliance, timely benefit payments, and the prompt and fair adjudication of claims involving Michigan's injured workers". Michigan workers who have suffered catastrophic loss from a work injury will need the assistance of a Michigan workman's comp lawyer. 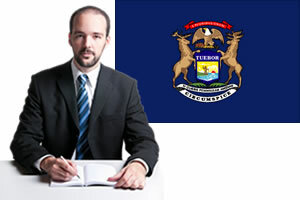 Workers' compensation attorneys in Michigan understand Michigan workers' compensation laws and can answer questions. Hiring a Michigan workers' compensation lawyer who understands the legal process and who may know the hearing officers and the administrative law judges can greatly improve an injured worker's chances of receive fair compensation. Work comp lawyers understand the types of benefits injured employees are entitled to collect and can facilitate the workers' compensation process. Do not allow your employer or the insurance company to force you to settle for less than you deserve. If you have been harassed, fired, denied benefits or discriminated against because of your Michigan work injury, a Michigan workman's comp lawyer can help. Most other Michigan work injuries are covered under Michigan workers' compensation insurance including the following common injuries and occupational illnesses: Back injuries, Concussions, Abrasions, Burns, Amputations of legs, arms, fingers or toes, Cancer from a certain chemical or toxin, Heart attacks at work, Strokes at work, Carpal Tunnel Syndrome, Post traumatic stress disorder, Radiation poisoning, Asbestosis, Pulmonary conditions. Workers compensation in Michigan provides a variety of benefits for the majority of workers who are considered public or private employees. There may be exceptions for specific industries or for certain Federal government employees. Agricultural workers also may not be automatically covered under Michigan's workers compensation program. Employees who are covered under workers' compensation can receive medical benefits, death benefits, vocational rehabilitation, and wage loss benefits. Medical Care Benefits - Medical benefits are paid for all necessary and reasonable medical expenses related to the employee's work injury. Medical benefits can include payment for dental care, hospital stays, nursing care, medical supplies (crutches, wheel chairs), physical therapy and prescribed medication. Medical benefits are provided for the duration of the Michigan work injury. Employers may choose the employee's treating physician for the first 10 days of treatment, but the employee may be able to make changes after ten days. If a large company has their own doctors the worker may have to receive medical care from the company's doctor first. It may be possible for the company doctor to refer the Michigan employee to a specialist. Refusing medical treatment may result in loss of continued workers' compensation benefits. Death Benefits - Death benefits are paid to the dependents of deceased workers who have died from their work injury. Death benefits are paid at 80 percent of the after-tax value of the wages the worker was receiving at the time they were injured. Death benefits are paid for a total of 500 weeks, except in the case of minor children. Minor children who are mentally or physically impaired may receive death benefits indefinitely. Michigan death benefits may be lowered if the dependents are only partially dependent on the deceased. If a worker dies and is unmarried and does not have children the estate may be paid a burial allowance not to exceed $6,000. Vocational Rehabilitation - Section 319 of the Michigan Workers' Compensation Act gives the injured employee the right to vocational benefits. Vocational rehabilitation options vary by state. In Michigan it may be as simple as the employer making modifications to assist the worker to return to their previous work, or it could include working with a counselor who assists the employee find suitable work, given their current work capabilities. Vocational rehabilitation can be provided for up to 2 years. Wage Loss Benefits - Michigan workers who are unable to return to work after their Michigan work injury may be entitled to wage loss compensation which is equal to 80% of their after-tax pay at the time of their Michigan work injury. Wage loss benefits are paid to injured employees if they were partially or totally injured at work. Wage loss compensation can also be paid if the employee returns to work after their work injury but is unable to perform their previous job. In this case, workers' compensation will pay the employee 80% of the difference between their previous and current wage. Wage loss compensation is not paid until the work injury lasts more than one week. Wage loss benefits will begin on the eighth day of the employee's work injury. The injured employee may be compensated for the first 7 days if their Michigan work injury lasts for 2 weeks or longer. Michigan's wage loss benefits are paid as long as the employee is disabled.